family favorite! 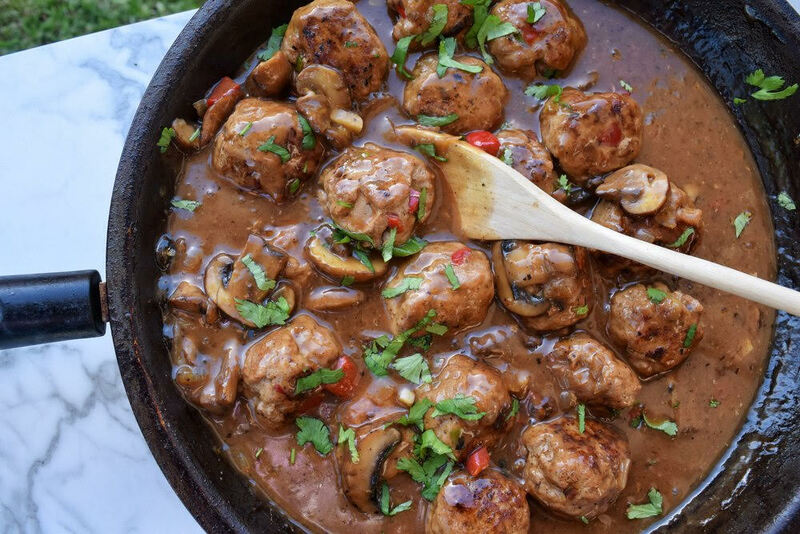 tender, hearty meatballs in a low calorie, savory & sweet 'marsala' mushroom sauce. remove meatballs from your pan to a plate, cover, and set aside. add remaining 2 tbsp butter to your pan on medium heat and let it melt; immediately add cornstarch and whisk vigorously to combine. set heat to high; add meatballs back in along with sliced mushrooms. combine everything together well and once the mixture boils, reduce your heat to low and let everything simmer for 8-10 more minutes as the sauce thickens and the mushrooms cook down. add more fresh parsley for garnish and serve over your favorite type of pasta! *if you don't use low sodium chicken broth, your sauce might be too salty for your liking because of the coconut aminos.